This is the weekly newsletter keeping you up-to-date with the activities of 15M movement in Barcelona, Catalonia and occasionally the main events in Spain. If you do not wish to receive it anymore, please say so. 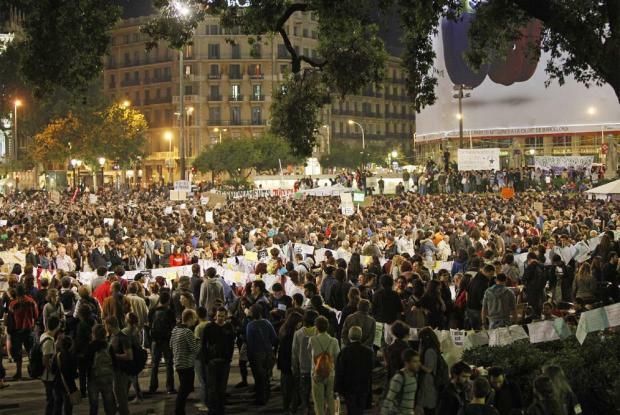 The 15M citizens’ assemblies in different cities in Spain, along with other networks and social organizations, have built a platform for a Citizen Debt Audit to determine its illegitimacy. It began a process led by the people to address the debt problem, denouncing those responsible for it and demanding the non-payment of an illegitimate debt. In Spain, as in other countries in the European periphery, we are witnessing a Debt Crisis used to justify the social cuts and austerity policies which are destroying social and labor rights won with the effort and struggle of past generations. Basic public services such as education, health and social services are being reduced and privatized with impunity. Citizens are seeing their retirement age delayed, their living conditions made precarious, their pensions freeze and their labor rights disappear. There is more than enough evidence of illegitimacy in the Spanish Government’s debt, as, together with the EU and regional governments, they are using it as the reason to go ahead with bleeding austerity policies. This is why we have the right to know, to understand the details of the process that led us to this situation. This initiative has, among other objectives, the need to recover our democratic and sovereign power to be able to decide what to do with the debt and with our future, without the interference of financial markets, the European Commission, the ECB or the IMF. The debt of the Spanish economy is huge, above 400% GDP, but who subscribed and benefited from this debt? Is it true that we have lived beyond our means, as repeated over and over again by the press and the Government? Or, on the contrary, has this debt benefited a powerful minority that continues making profits with privatizations and austerity policies? Are we paying a debt we haven’t created, a debt that was subscribed against the general interest of the people? Or is the mechanism designed precisely to generate an illegitimate debt? The Audit collective will be in our squares during Global May to denounce this situation and build together a citizens’ platform to dismantle the official discourse. The International Citizen Debt Audit Network (ICAN) brings together movements and networks in different European and North African countries, fighting austerity measures through the implementation of Citizen Debt Audits. Greece, Ireland, Portugal, Spain, Italy, Poland, United Kingdom, France, Germany, Belgium, Egypt and Tunisia are all developing or initiating Citizen Debt Audit campaigns against austerity and debt. In order to promote a Popular Legislative Initiative (ILP in Spanish), the “Associació de Veïns i Veïnes del barri Gòtic” (Association of Residents in the Gothic Neighborhood ) and “Compartir Dona Gustet” (Sharing isTasteful – a Cultural and Culinary Collective) organized, on Saturday May 5th, the “PAELLA POPULAR DEL GOTIC”. Starting from 12.30pm, there was a lunch party where you could taste this paella, which obviously took place in a square, Plaça de la Mercé, in the center of Barcelona. It wasn’t just a popular lunch, it was also a party with music and live performances, attracting people to collect signatures supporting the ILP to modify the Spanish mortgage law. Stopping evictions, as the situation in Spain is dramatic: between 2007 and 2011 there were 349,438 foreclosures, and it is a rising social problem as those most affected are unemployed people. Regulating the Assignment in payment, as people that already gave back their homes shouldn’t have any further debt with the bank or with the financial entity who lent them the money. The deadline to collect a minimum of 500,000 signatures is October 31st, and by then the driving forces – PAH (Plataform of the Affected by Mortgages), the unions UGT and CCOO, and the observatory DESC (Economical Social and Cultural Rights) – hope to gather millions of signatures. On one hand, we have had years of banks, financial entities, property companies and property developer increasing their income and their business. On the other hand, we have now thousands of evictions and families condemned to pay the debt of their mortgage even after the loss of their houses. In order to face up to this dramatic reality in Catalonia, the first cooperative of social housing, CIC Habitatge Social, has emerged, which rents mortgaged flats in order to provide housing to the debtors unable to keep paying their mortgage. Debts are sold and bought like products on the financial market. Banks are currently selling mortgage debt at 10%of its nominal value (the amount remaining to be paid after having lost the house) and at 2-3% in the case of a non-secured loan. The cooperative pretends to buy these debts collectively, and stops asking people to pay the debt generated by the mortgage. In this way, the cooperative will have houses to rent at no more than 4€ per square meter to people that can’t afford to keep paying their mortgage. Their initial technique is as follows: people who know they can’t afford to pay their mortgage can rent their house to the cooperative for 5 years, which keeps them safe from eviction, whilst at the same time they go to live in a place rented from the same cooperative, which also gives legal support. The long term goal is to create a social housing park to be offered for the use of its members. In Spain there are around 26 million houses, 20% of which are empty, while millions of people do not earn a decent living, or not at all, so most of them have been evicted. This idea is another way to put people and their well-being ahead of private property. In Catalonia we see many towns and cities preparing for 15M, most of them convening at 6pm in the main square, Plaza Catalunya, intending to remain there and run the “Forum” until the 15th of May. Both Barcelona and Madrid, like many other Spanish and world cities, have prepared an extensive program of meetings and debates on the street, as well as artistic and cultural events, and, above all, action! People involved in the organization are looking forward to a great day, and are looking forward to action after a long preparation: Thousands of people will take to the streets once more to fight for their rights, in order to recover public space and assemble once more in the streets. Many have said that the movement has no future, that it wouldn’t achieve anything, but there are thousands of people from hundreds of cities, working together in small groups, on small projects that try to create to a better world. Many of these projects may seem invisible to the eyes of society but, at the same time, it seems to increase the awareness of citizens. The same newspaper that decreed its death seems to have changed its mind, now talking of “silent revolution”. The whole planet is convulsed by economic inequalities and social cuts. Money is more important then people, and in order to truly change this order, there is still an enormous amount of work to do. But the people are rising up all around, and governments will find it very difficult to stop it from happening.